I am very fond of scientists, but I have to admit that their discipline tends to make them pedantic (I suspect even I can be occasionally) - which is fine when assessing science, but rubbish when thinking about use of English. Scientists should realise this. Suggesting language should have a fixed set of rules that always apply and never change is a bit like saying all species should be as they were 6,000 years ago and never change. Language is far more like biology than physics. The particular bit of scientific pedantry that gets my back up is the instance that the word 'data' should be treated as plural. So scientists will pedantically insist on writing 'the data support the hypothesis' rather than 'the data supports the hypothesis.' To every normal person, the scientists' version is clearly wrong. Because language evolves, and the way we use the word 'data' has evolved too. This makes a huge amount of sense. There are very clear similarities with the way 'money' and 'data' are used as words. But the trouble with being a pedant is that you can stick with an outdated theory far longer than you should. So those who want data to be plural, scratch around for a justification and think they have found one. 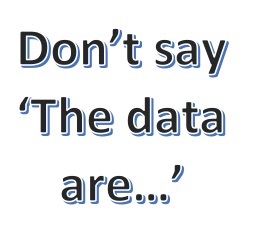 'Ah,' they say, 'data has to be plural because it is a Latin word, the plural of datum.' But this is rubbish. Classical plural forms are decreasingly used in English, and have never been definitive. If you really wanted to be pedantic about Classical plurals - and even Fowler thought this was silly - the plural of octopus would be octopodes. Data has become a word we use for something that had nothing to do with its Latin roots. No, you've lost this one scientists. Data, as a word, should work just like money does, and it's about time you switched away from this clumsy usage.